Just when I’d been writing yesterday that I was puzzled that so many of New Zealand’s elite seem to think that New Zealand has done quite well in recent years, and seemed quite indifferent to the number of people unemployed, along comes another example. How could one “rationally” disagree? Well, it is certainly true that the ratio of employment to population in New Zealand is quite high by international standards (though any table in which, as with Smellie’s, New Zealand is bracketed between Colombia and Russia should probably be a bit of a warning), but by what criteria is Smellie judging this to be “a good thing? There is no real hint in the article, except perhaps a Stakhanovite sense that more paid labour must somehow be a good thing, for someone. For“the national interest” perhaps? But labour is a costly input – costly not just to the employer who has to write the cheque to pay for it, but for the employee who gives up the time and opportunities he or she would otherwise have. Some people have a real passion for the paid employment they do, but for most they work because they have to, to provide the basics for themselves and their families, and because the value to them of the things they get to consume (or risks they get to allay) as a result of working outweighs the cost of giving up free time. I’m disgruntled that our governments have continued to run policies that mean that 10 per cent of working age adults are on welfare benefits (and did I really hear that, despite this, the ACT Party last night voted to raise real welfare benefits?). I’d prefer that most of those people were providing for themselves – which for many/most would involve paid employment A move in that direction would tend to raise our labour force participation and employment rates. But equally I’m glad that my elderly mother does not (have to) work A larger share of the population in much older age groups will, quite reasonably, tend to lower labour force participation and employment rates, even if we could get the NZS eligibility age raised somewhat. And polling data shows that many parents would prefer that one of them was able (financially) to stay home full-time at least when they had young children – but our scandalously expensive house prices, especially in Auckland, make that very difficult for most. Reforming land and housing markets to make housing more affordable might lower participation and employment rates – and that would seem likely to be a good thing, (given private preferences). There are reasons to be concerned if public policy measures are unreasonably discouraging people from participating in the labour force. But a measure of a country’s success is not the proportion of its adult population that is in the paid labour force (or the hours they work – see, eg, Korea). Personally, I counted it as a measure of our family’s modest success that I’m not in the labour force any longer, and have no intention of being regularly in it again. I get to do for my kids what my mother did for me. That is gain not a loss. And that is, of course, why most attention in the labour market data goes on the unemployment rate, because it is a measure of the people who want to work, are actively looking for work, are available for work now, but don’t have a job. As a general proposition, the lower that number is the better. These people would prefer to be working – not necessarily in just any job, but in a job – and are taking active steps to find one. One can take the economist’s tack and (somewhat queasily) compare people unemployed to goods on the shelf of a supermarket. I can always buy butter when I want it only because the supermarket stock enough to cope with fluctuations in demand. Those stocks serve a valuable purpose (which is why the supermarket owners willingly pays the cost). The unemployment story is a bit different; a pound of butter is a fairly homogeneous commodity, and people are not. The search and matching process – matchng the “right” job to the “right” worker – takes time and effort. Mostly, workers would probably prefer to do that matching while they are still in another job (whereas a pound of butter can’t be in my fridge and simultaneously available for another casual customer wandering into the supermarket), but sometimes unemployment actually allows the time for a more intensive search (or search in a different city). At the margin, unemployment benefits make that a more feasible option than it would otherwise be (as, of course, do private savings, and the pooling of multiple incomes within a household). But unemployment is not something we can, or should, be complacent about. I think there was something profoundly right about the post-war emphasis on achieving full employment, even if it was carried too far, and pursued in ways that were probably detrimental to the longer-term economic performance of the country. “Full employment” barely even figures in modern discussion, except perhaps when macroeconomists are tempted to treat a NAIRU as something akin. 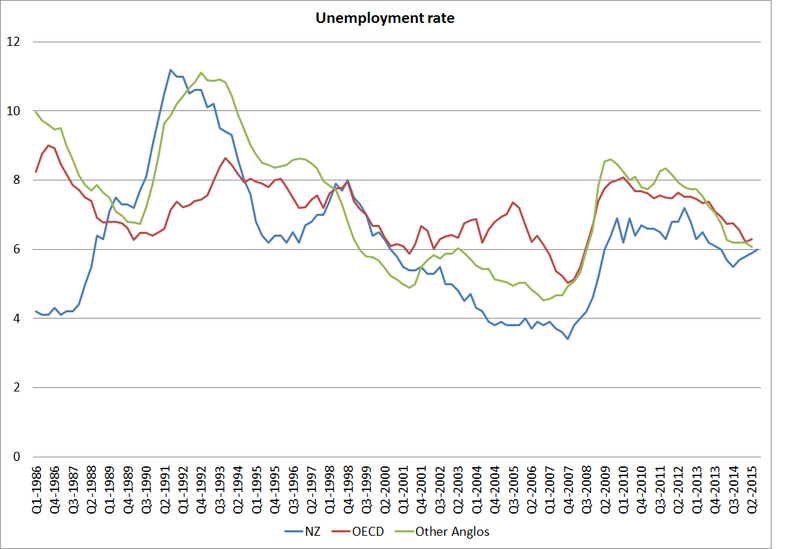 New Zealand has had a mixed historical record on unemployment. Here is how our unemployment rate has compared with the median OECD country’s unemployment rate, and that for the median of the other Anglo countries (Australia, Canada, Ireland, US and UK) since the HLFS was set up. Mostly, we haven’t done too badly – the big exception being, of course, the late 1980s and early 1990s, when inflation was being brought down and a good deal of structural reform was going on. Things are not terribly bad compared to these other countries right now, but they aren’t that good either. The United States and the United Kingdom, both of which went through nasty financial crises, have lower unemployment rates now than we do. And both had long since more or less exhausted the room for conventional monetary and fiscal policy to do much about helping to deal with any cyclical components of unemployment. We haven’t. Even the US unemployment rate of 5.1 per cent is still, as I noted yesterday, consistent with every person spending two years, in a forty year working life, officially unemployed. Markets look as though they should be able to work better than that. Andrew Little: What responsibility, if any, does he take for unemployment rising to 6 percent? Hon BILL ENGLISH: Of course, if unemployment was a direct choice of the Prime Minister of New Zealand, there would be none of it. You would just decide to have none. But, of course, it is not. The flippancy is perhaps par for the course in the House (question time is partly about “gotcha”), but I looked at Hansard and nothing in the answers to the supplementaries gave me any greater confidence that the issue was being taken very seriously. The question wasn’t about the absolute rate of unemployment, although there must be plenty of structural stuff governments could do to lower that over time, it was about the increase in unemployment that has now gone on for several quarters, and is apparently forecast to go further. As I’ve noted previously, it is fair for the Minister of Finance to respond that he doesn’t directly control the principal lever of stabilisation policy, which is monetary policy. But he hires, sets the goals for, and fires the person who does – the Governor of the Reserve Bank. We depend on the Minister of Finance to hold the Governor to account, both directly and through the sort of people he appoints to the Reserve Bank Board. Judging by the Minister’s public silence, by the absence of any concern about the issue in his annual letter of expectation to the Governor, and by the “we look after the Governor’s back” approach taken by the Board in their Annual Reports, unfortunately he associates himself with the errors the Bank has made, and keeps on making. The Governor’s errors are those of commission and the Minister’s might be those of passivity or omission, but they are choices nonetheless. The increasingly large number of people unemployed suffer the consequence. In closing, a final observation on the Smellie article. He claims that our participation rate/employment rate are remarkable because they are coinciding with “unprecedented” [not actually, but rapid certainly] population growth, reflecting strong net inward migration. I reckon he has that story the wrong way round. For decades, every economic forecaster in New Zealand has worked on the basis that the short-term effects of immigration are such that the boost to demand that results exceeds the boost to supply. Immigrants have to live somewhere, and need roads, schools, shops etc – so they need day-to-day consumption, and a material addition to the physical capital stock. That is why the Reserve Bank tends to tighten monetary policy, all else equal, when immigration picks up. There is lots of debate about the long-term effects of immigration, but there has never been much doubt about the short-term effects. Immigration to New Zealand doesn’t boost unemployment; all else equal it lowers it. If we’d not had the impetus from immigration over the last couple of years, we’d be grappling with even weaker inflation pressures and more of a need for the Reserve Bank to have cut interest rates further. Simply noting here, but skipping over, the wider measures of unemployment and underemployment. To what extent do you think our (and others) high housing costs are because of the move to two-income families? It seems to me that the lifestyle choice by some has the potential to push up prices for housing (and demands around quality etc) so that it becomes an essential for others. The analogy I make in my own mind is how dairy prices push up dairy farm values. More income comes out as higher capital costs… and similarly the higher income of dual income families has meant that they can bid up housing prices. It might be there a bit in respect of the quality of housing, but then the two incomes are counted in the “household disposable income” data that are used in calculating price to income ratios, and those ratios in NZ (and esp in Akld) are very high. My view is that land use regulation, exacerbated in its effect by high inward immigration, are the root cause of the problem. Even with no population growth we’d still have excessive restrictions on land use – and it section prices, not house prices themselves, that have gone sky high. The Unitary Plan allows for a 2nd dwelling on all the Mixed housing zones, ie suburban, urban, apartments & terrace housing of minimum size 40sqm with a separate kitchen. Existing houses will get bigger and allow for a separate rental income on virtually most Auckland housing stock as a base minimum. Does not mean cheaper houses but could result in cheaper rents. Under the Auckland Unitary Plan, practically all mixed housing zones will allow for a 2nd dwelling attached to the main dwelling with a separate kitchen which provides an additional rental income potential. “Where a dwelling is proposed to be converted into two dwellings each dwelling must have a net internal floor area of at least 40m². c. comply with the daylight and minimum dimension of principal living rooms and principal bedrooms development controls. 3. The primary dwelling must exist on the date of notification of this Unitary Plan. We all tend to analyse issues such as unemployment with simplistic cause-and-effect logic, without looking at the multitude of causal factors. In addition, when one looks at history, government is almost always the cause of higher unemployment and rarely the solution to it. 1) Up until the 1930s and 1940s, the family unit was far stronger than it is today. Young people saved to look after their parents in old age. Then, governments told them not to worry – they would create pension systems and the state would take care of them in old age. Then came the DPB, etc. Fast forward to today and the NZ government (like all governments, never a productive entity in itself) is around 35% of GDP. Many countries in Europe are over 50% of GDP. To sustain this social expenditure means that taxes must rise, which are a drag on the real economy and invariably will lead to greater unemployment. 2) The social welfare system is directly responsible for rising unemployment – fact. If one can earn more on the DPB than in blue collar employment then where is the incentive to work? 3) The education system always lags the real economy and adds to the mismatch between qualifications and needed skills. In the US, 65% of college/university graduates are not employed in their chosen field. This is a disaster for the $1 trillion+ student loan “investment” return in the US (and one of the reasons Hillary championed the bill making student loans non-dischargeable, to support her major banking donors…another story entirely). The NZ situation, although not as bad, is heading the same way. 4) Indirectly and directly, governments have been attacking the working and savings classes, which further increases unemployment. How? By taxing more and manipulating short term interest rates down, governments and central banks have effectively reduced the ability of workers to save and thereby fund productive investment. Why work and save if the return is negligible or negative? In addition, Clinton repealed Glass-Steagall – allowing US banks to effectively trade and gamble with depositors funds (resulting in the 2008/09 blow up), safe in the knowledge that government (read taxpayers) would bail them out. Now, most central bank laws dictate that depositors will be directly on the hook when they blow up again. So, I ask, where is the incentive to work, save and create employment? The causes are multiple and plain to see, and we have the stupidity to look to government for the solutions. The likes of Rubin, Paulson, Clinton, et al, have left us with a toxic legacy that will be with us for generations, sadly. Welcome to the death of socialism, or crony capitalism…whichever tag you please. For the US – I would take the U-6 measurement as a more reliable measurement of unemployment – would go some way to explaining the weak retail figures. Personal opinion would be that headline rate is getting increasingly irrelevant in determining the respective economic health of a country. The loss of relatively highly paid manufacturing jobs replaced by lower paid service ones is definitely not a case of like for like. I don’t have a problem with focusing on alternative measures – I think they are quite enlightening for some purposes- but then of course one has to do so for NZ too. One reason for focusing on the headline figure is the international comparability of data. Judging by their enthusiasm for a minimum wage of $14.25 and, at local government, a living wage of $18.80, we must infer that our elected representatives are feeling tremendously relaxed and comfortable with the level of unemployment. As international students and tourists are included in immigration numbers, don’t forget that international students pay and spend $30k to $40k a year for fees and living expenses. The various Universities have also spent $1 billion in the last couple of years and another $1 billion in the next few years on student infrastructure. Tourists also are a record 3 million and have overtaken Dairy as the top export contributor to our local economy which do translate to jobs in the hospitality industry. New hotel developments are being planned which produces jobs. Don’t forget the transmission mechanism through the lower real exchange rate. I don’t the RB would dispute that a lower OCr would lower unemployment, they just persist with forecasts that say inflation will get back to target without much in the way of further cuts – as they have believed for the last five years or more. As a property investor I have a bias towards lower interest rates and as a direct result improves my profit margin and spending capacity. However, I am also concerned about the potential inflationary impact of a lower NZD which would impact on the price of imported goods and increase the cost of my usual overseas vacation. A neutral OCR I believe should be 2.5%. Still high by global standards but with LVR restrictions in place retail interest rates should still be around 4%. Without LVR restrictions banks tend to keep interest rates around the 5% mark. With LVR restrictions in play, we should practically see NZ banks continue to drop NZ cash deposit rates to maintain their margins. I haven’t watched it for a year or so, but I think she concentrates more on quantifying the impact on individual households – whereas I’d really love to see some analysis on the corresponding economic impact on society as a whole. I’m really enjoying the blog. Thanks, as the effort is surely considerable.